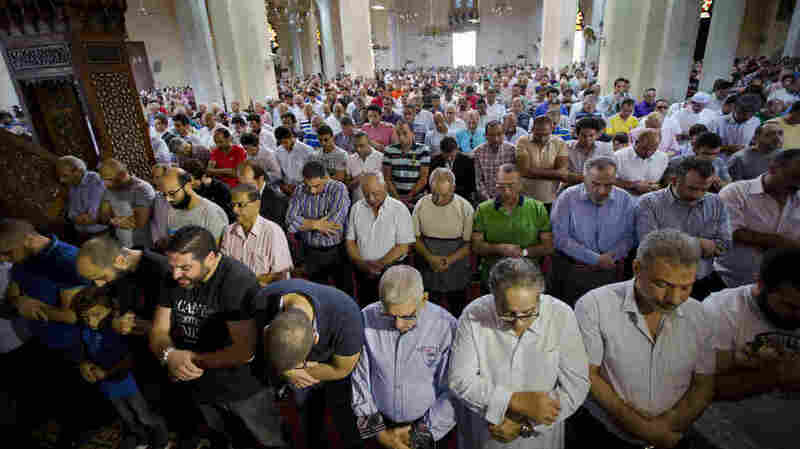 EgyptAir Crash: Egyptian Man Mourns The Loss Of 4 Loved Ones : Parallels At mosques across Egypt, worshippers prayed on Friday for those killed when an EgyptAir plane plunged into the Mediterranean a day earlier. The cause of the crash still isn't known. Egyptians pray for the victims of EgyptAir Flight 804 at Al-Thawrah Mosque in Cairo on Friday. The Egyptian military said it had found some wreckage of the plane, which was carrying 66 people when it went down early Thursday over the Mediterranean Sea. After the regular Friday prayers at Cairo's Sultan Hussain Mosque, it was time to say prayers for the dead. Worshippers outside for the overflow service stood in neat rows through four calls of "God is great." They said silent prayers in between. Afterward, Khalid al-Kassam, 67, received hugs and claps on the back from many friends. His brother and sister-in-law, plus their son and his wife, were all on EgyptAir Flight 804. The son and his wife have two small girls, one age 2, the other just 8 months old. The children were not on the plane. They stayed with relatives in Cairo while their parents and grandparents went for what Kassam said was a vacation to Paris. "What can you say? It's life. It's life. And there are many tragedies, not only ours. There are tragedies," said Kassam. Egypt's military said the navy has found some of the wreckage and some human remains from EgyptAir Flight 804, which went down in the Mediterranean Sea early Thursday. There's still no word on what caused the crash that killed 66 people. A friend of the Kassam family, Khalil Kandil, 48, described Ghassan Abou Laban, the father of those two little girls left behind, as a "gentle" person who had been married three years. His wife was from Syria, Kandil says. "All these accidents, you always hear about them, and they're somebody else," Kandil adds. "That's the first time for me to have somebody I really know, know very well, that he's taken away." But it's not just a personal loss that Kandil feels. He's a businessman. He has worked in heavy industry and shipping consumer goods to neighboring countries. He says in the end, the deadly crash just adds to the current woes of the region. "At the end of the day, nobody will care a lot about why this plane crashed. Is it really a terrorist act or a [mechanical] failure? It's just another problem adding to the area, killing the tourism," he said. A sense of deep sorrow sprinkled with fatalism permeated the crowd on the mosque sidewalk. Mariam Abu Shakra, 22, who just graduated from college, came to pay her respects even though she did not know any of those killed. "It affected a lot of people," she said. "And it's not something small. It's not something someone could be quiet about. It's something huge. I don't know, I just see it as something really big."